-A piece of low glycemic fruit: green apple, strawberries, blueberries, blackberries, grapefruit or other. -Homemade beef, chicken or vegetable broth. (Add some cooked veggies for something more filling). -Veggie Omelet (try to find organic or free range eggs) Try spinach, tomato, red bell pepper, asparagus, broccoli, zucchini, a bit of green or red onion, a few black olives etc. -Scrambled eggs with guacamole or fresh avocado slices. -Homemade seed cereal - In a food processor blend, any 3 of the following well: pumpkin seed, chia seed, flax seed, hemp seed, sunflower seed, dried shredded unsweetened coconut) add hot water and stir well. Add cinnamon, stevia or raw honey, and almond milk if desired. -Oatmeal (soaked overnight) with cinnamon, coconut oil, sea salt, stevia or raw honey. -Sunflower seed butter on celery, cucumber slices or sprouted whole grain toast. -Sunflower sesame crackers (See Recipe Section) have with various spreads and dips or plain. -Potato vegetable hash. (See Recipe Section) You can try hashing potatoes with other veggies such as kale, broccoli, spinach, carrots, egg plant, tomato, cauliflower. -Sweet potato hash - Diced sweet potato, onion, chickpeas and spinach hashed in coconut oil. Plus sea salt and pepper. -Chia bread (See Recipe Section) eat with various spread and dips or plain. -Cucumber roll-ups (See Recipe Section) Use any filling you like. -Nut butters (almond, cashew, sunflower seed butter etc.) on red pepper slices, cucumber slices, celery sticks or on sprouted whole grain toast. -Hummus with veggies such as cucumber, carrots, zucchini etc. -Sprouted whole grain toast with butter or coconut oil and a few slices of fresh avocado. -Romaine lettuce wraps (See Recipe Section), use romaine leaves and spread with hummus, add some baked chicken and some thinly sliced peppers, cucumber etc. 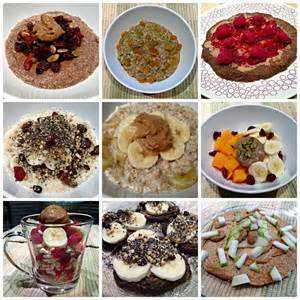 -Hot cereal made from buckwheat, tapioca, quinoa, millet or amaranth.